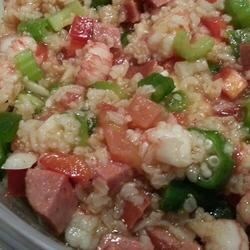 "This is a New Orleans-style salad with shrimp, ham, bacon, rice, and Creole seasonings." I wasn't happy at all with this salad. Too salty. We are from the south and my husbands family is from the low country. This salad was unique but everyone loved it even my picky 13 year old. Will be putting this in my book for future use. This recipe is fantastic. I served it with fresh bread and wine, my husband went crazy over it. We can't wait to have it again. It's a definite keeper.